I’ll be completely honest, I’m not a huge milkshake maker. I mean I won’t turn down a milkshake, but I very rarely make them myself. I think that’s because I just love ice cream in its actual form much more. So I usually find that I don’t like shakes as much as just a bowl of the stuff. But milkshake was a blow-out winner in last week’s poll so I tried to come up with something pretty simple and delicious for you all. What’s cool about milkshakes is that you can obviously add almost anything you want to them. You can make ice cream with tons of add-ins also but it takes way more work to make customized ice cream than customized milkshakes. For this version, I wanted to start with a chocolate milkshake and then add some really flavorful stuff like peanut butter and coconut milk. It turned out really great! 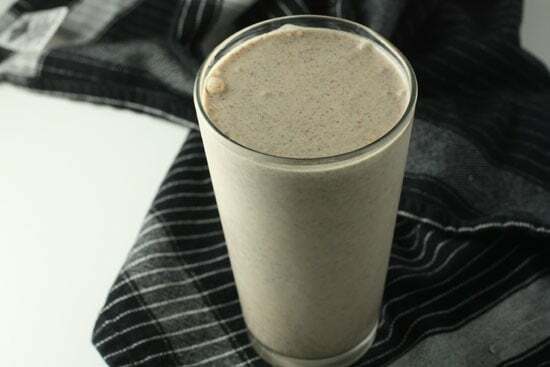 This is a chocolate milkshake at it’s base but I add a good amount of coconut milk and peanut butter to it which really kicks it up a notch. 1) Put all the ingredients in a blender and pulse until smooth. 2) Taste and adjust the flavors to your liking. If it’s too thin, add more ice cream or peanut butter. If it’s too thick, add more coconut milk. Most milkshakes have, well, milk. But I decided that could be an opportunity to add some extra flavor to the party so I used coconut milk instead. I loved the switch. Also, I used a whole chocolate bar which gives the shake some chunky texture. 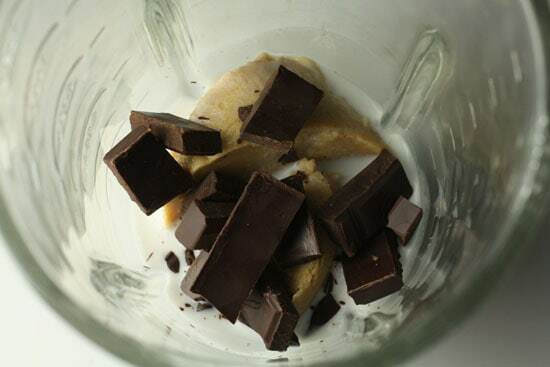 If you want a smoother shake you can use cocoa powder or chocolate sauce though. The peanut butter I made was from my last homemade peanut butter batch, but you can obviously use whatever variety you like. Creamy works a bit better for milkshakes I think. Homemade peanut butter is good. 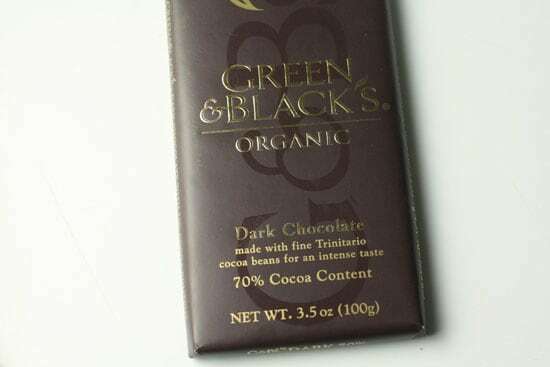 This is the chocolate bar I picked out for this shake. Man was it good. 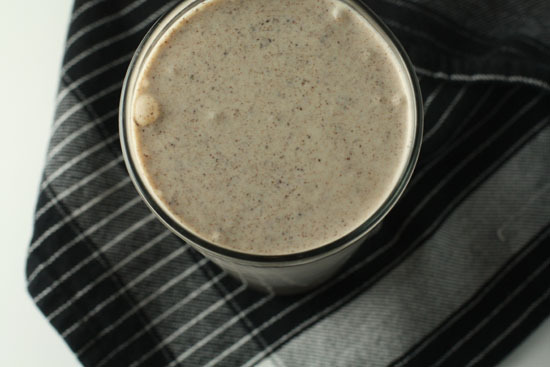 The key thing to remember about a shake is the balance of liquid, add-ins, and ice cream has to be just right. So start with what I list above (or half it if you’re making one) and then feel free to adjust based on how yours looks. 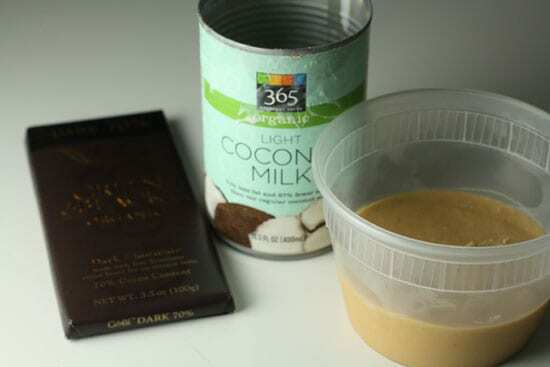 You may need to add a bit more ice cream or coconut milk depending on consistency. No matter what though, I think I always get the best results by putting the add-ins at the bottom of the blender. The coconut milk helps get the blending party started. I had a good feeling about this. Add the ice cream and blend it up! 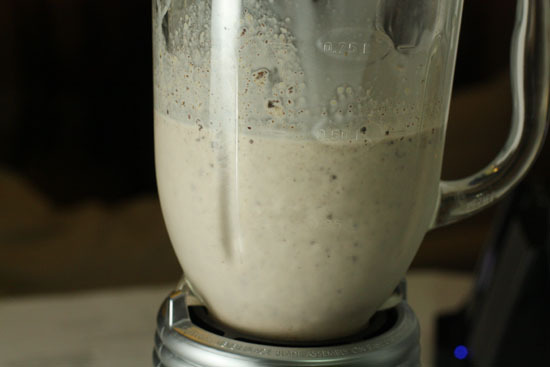 Depending on how thick your shake is, you might need to stir it a bit to get everything blended. If it’s too thin, you can add a bit more ice cream or peanut butter to thicken it up. It takes maybe 30 seconds of solid blending to get a good consistency. Pour it up and serve it immediately! I’m not really big on garnishes for milkshakes but if you wanted you could use some whipped cream or maybe stick a peanut butter cup on the side of the glass. Honestly though the shake is pretty rich so it doesn’t need much else. No crazy garnish for me thank you. I think this is my first milkshake on Macheesmo that isn’t made from snow. I actually really liked the flavor and it would’ve been a lot more work to make ice cream with the coconut flavor and everything. Quick, refreshing, and rich. I guess maybe I’ve convinced myself that the milkshake needs to make a few more appearances in my dessert lineup! oh that does actually sound good. i’m not a huge milkshake person. but since you added coconut milk i’m in–love that stuff. « Shaved Zucchini Salad Recipes Home » Around the Internet Kitchen: San Francisco!